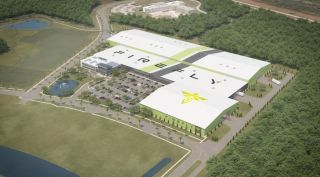 WASHINGTON — Firefly Aerospace announced agreements with state and federal agencies Feb. 22 to build a new factory for producing and launching its rockets from Florida's Space Coast. The Texas-based company said it had reached an agreement with Space Florida, the state’s space development agency, to help fund development of a launch site at Space Launch Complex (SLC) 20 at Cape Canaveral Air Force Station and a launch vehicle factory just outside the gates of the Kennedy Space Center. The company also received a "statement of capability" from the U.S. Air Force's 45th Space Wing regarding use of SLC-20. Under the Space Florida agreement, the state will match Firefly’s infrastructure investments up to $18.9 million. The company says it plans to invest $52 million in the factory and launch site development, creating more than 200 jobs. "From this site, Firefly is going to execute its business plan, which is to dominate medium to small spaceflight market," said Tom Markusic, chief executive of Firefly, during remarks at a ceremony at SLC-20 marking the project. Firefly is currently working on its first vehicle, Alpha, capable of placing up to a metric ton into low Earth orbit. Initial production of the vehicle will take place at the company’s Texas facility, with a first launch from a former Delta 2 pad at Vandenberg Air Force Base in California scheduled for December. The company, though, has discussed building a separate manufacturing facility for producing the Alpha in larger numbers. "Our goal is to ramp up to 24 launches a year. We can do maybe six rockets a year in our Texas facility, so we're actively looking at establishing a large-scale mass production facility," Markusic said in a talk at the International Space Development Conference in Los Angeles in May 2018. Even then, Florida was a frontrunner for the factory. "Florida is of interest, but we’re looking at others as well," he said. "Obviously being near a launch site would be good, so Florida and East Coast launch out of the Cape is probably the most likely scenario, but we’re keeping an open mind." Texas-based Firefly Aerospace aims to launch small satellites on its Alpha rocket. The new factory will be able to produce 24 Alpha vehicles a year, Firefly said in its statement announcing the facility. The company didn't say when the factory would open, but said it hoped to start launching from SLC-20 in 2021. The 180,000-square-foot factory will be located in Exploration Park, a business park on the grounds of the Kennedy Space Center but outside the center's security perimeter. The same area also hosts a Blue Origin factory where the company will produce its large New Glenn rocket, as well as a factory where OneWeb Satellites, the joint venture of OneWeb and Airbus, will build satellites for OneWeb's broadband constellation. Firefly is also the latest company to set up launch operations at an inactive Cape launch site. Relativity announced Jan. 17 that it planned to launch its small launch vehicle, Terran 1, from Launch Complex 16 at Cape Canaveral, just to the south of SLC-20. Relativity’s launch vehicle, capable of placing up to 1,250 kilograms into low Earth orbit, is slated to make its first launch from that site in late 2020. Blue Origin is redeveloping Launch Complex 36 for launches of New Glenn, with a first launch scheduled for 2021. In an interview with SpaceNews at a Wings Club luncheon in New York Feb. 20, company founder Jeff Bezos said he estimated the company would spend about $1 billion on the manufacturing and launch facilities for New Glenn.